Start your Spring Term off with a fun new project! Decorate fabric using thread by learning the basics of embroidery. Do some quick stitches or stay awhile and complete an entire project. 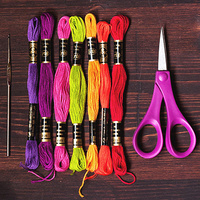 Our Freebie Friday Workshops are quick drop-in crafts open to any UO student. Please bring your student ID. Come by for a bit between classes or stay for a while. All materials are provided! Freebie Friday Workshops will be held every Friday all term long. Same place, same time, different craft.